Please note registrations for this challenge will be closed on the 17th of May & late entries after the 13th of May will not qualify for any of the prizes. 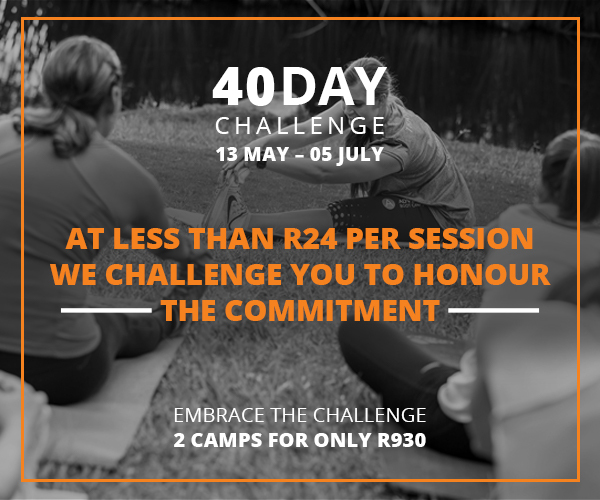 The 40-day challenge runs from 13May – 5July. Your goal is to honour the commitment and complete all 40-days. Only pay R930 for two consecutive camps. That is 40 sessions over 40 days for less than R24 per session. Payment will confirm your entry and you will stand a chance to win some exciting weekly prizes and a regional grand prize of FREE BOOT CAMP FOR A YEAR when you complete the challenge. Choose to either lose weight or build your general fitness or strength . We will equip you with a pre and post assessment, to help you track your progress. Once payment is received you will have access to your Camper Zone where you can enter your measurements and track your progress during the challenge. An assessment will also be conducted that will assist you in setting goals for the 40 days. Because we know that life can get busy, you get unlimited flexi’s to make up your 40-Days. We will allow 2 sessions a day to make up for any sessions missed (but we don’t recommend it). For less than R24 a session, you get daily fitness solutions and motivation from our qualified trainers. Can you even get a coffee for that price anymore let alone 1 hour of hands on personal training? Bargain! Receive a 8 week eating plan created by our qualified dietician to assist you in staying healthy during the challenge and reaching your goal at the end of the 40 days. At the end of the challenge we will be selecting regional lucky winners who have honored the commitment and finished the challenge. To qualify for the prizes you need to finish 40 sessions in 40 days. After signing up we will provide you with a with a nutritional meal plan from a qualified dietitian, pre & post assessments & daily motivations to help you achieve your weight loss or fitness goal over the 40 days. Join the NEW exclusive 40 Day Challenge Facebook group for daily motivations and to help keep you on track towards achieving your goal. (Note: Only paid members who joined the 40-Day Challenge will be accepted into the group). Don’t forget that this journey is about changing your lifestyle and having fun whilst doing it. By joining the 40-Day Challenge you get to share in the fun & win exciting weekly prizes. No day is ever the same, enjoy focusing on those problem areas with our variety of exercises which will help you get to your weight loss goal & increase your strength and fitness.